What to believe? Is it really true that you will be okay and saved as long as you believe something? Does it really matter what you believe or if you believe anything at all? Can you really know what to believe or who to trust to lead you in the truth? In a world and a society that increasingly offers a smorgasbord of religions, philosophies and world views, with wildly differing views of who God is, what God is, even if there is a God, what will you believe? In order to figure out what you believe, you also need to figure out who to believe. Who will you listen and put your faith in? Family, Hollywood movie stars, TV personalities, charismatic preachers, ancient philosophers, or something else? Some teach there is but one supreme being. Others teach that deity is everywhere and in everything. Still others teach that even if there is a supreme being, he certainly is not knowable by common man. 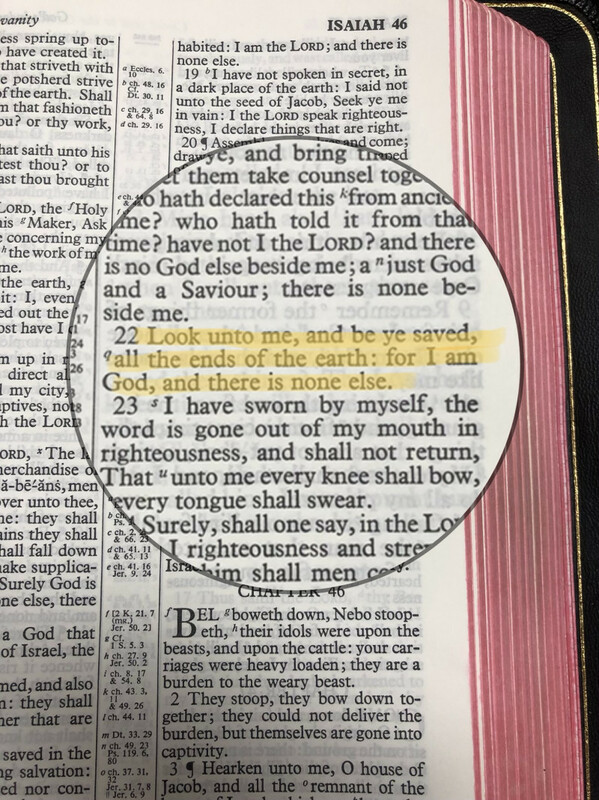 God calls for everyone in all the earth to turn to Him to be saved. God knows that there is and will be the confusion of many religious truth claims. Therefore He speaks with perfect clarity. He declares there is argument to be made, and there is no competition to be had. Furthermore, He is not hiding from us. He sent Jesus to the be light of the world and die for the sins of all mankind. He beckons us to come to Him through the price that was paid by Jesus on the cross. He invites us to inherit eternal life just as Jesus rose from the dead and lives forever. He gave us His Holy Word the Bible so that we can know not only the good news of salvation by faith in Christ provided by the grace fo God. What you believe is important? Your life and externality of your soul depend on it. It’s a big choice to be made. Which is why we are so blessed that there is a big God to answer it. God has recorded what took place in the beginning and what He did through sending His son to the earth for our salvation. The only one that was there through it all was God. No one else. All you have to do is accept what He has done by faith. 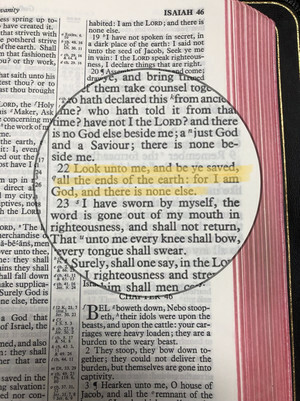 Repent of your inability to know Him or get to where He is on your own because you are a flawed fallen human, just as we all are, and turn to God by believing in what he has done and said as being true and the only way to get to Heaven. There is Only one God, and there is only one way to God...through Faith in Jesus Christ. What decision will you make? It you let it, anxiety will destroy you. Statistics say that 18.1% of Americans between the ages of 18-54 have been diagnosed with some kind of anxiety disorder. That is approx. 40 Million people. Although current estimates place the percentage around 30% because many people do not seek help or are misdiagnosed. Add in to that the growing trend of children less than 18 that are being diagnosed with anxiety, not to mention those over 54 struggling with anxiety. Did you know that there are 6 specific types of anxiety? One could get anxious just reading that list. According to “The Economic Burden of Anxiety Disorders”, a study commissioned by the ADAA, Anxiety disorders cost the U.S. more than $42 Billion a year. While certainly there are times that medication might be needed as prescribed by a doctor, realize that the Anti-anxiety medication business is a multi billion dollar industry. Not to mention the use “non-sanctioned” use of other drugs, and certainly the use of alcoholic beverages to sedate our worries and fears. Anxiety is a real problem in America and in the world. It will destroy your joy. I will destroy your peace. It will destroy your health. It will destroy your life. So what does the Bible say about the topic? Does it say anything at all? Worry is what happens when you structure your life around temporal things. In other words, Worry can consume you when you attach your worth, and happiness, and satisfaction in the things of the world. If you can misplace it, if markets can devour it, if rust can ruin it, or if thieves can steal it, don’t anchor your life with it. Follow these steps to avoid the destruction of Anxiety. Don’t trust in man or in man’s systems, but rather trust in God from the beginning. Trust him for your daily needs and rely on His faithfulness to provide for you as he has promised. Because He cares so much for you. 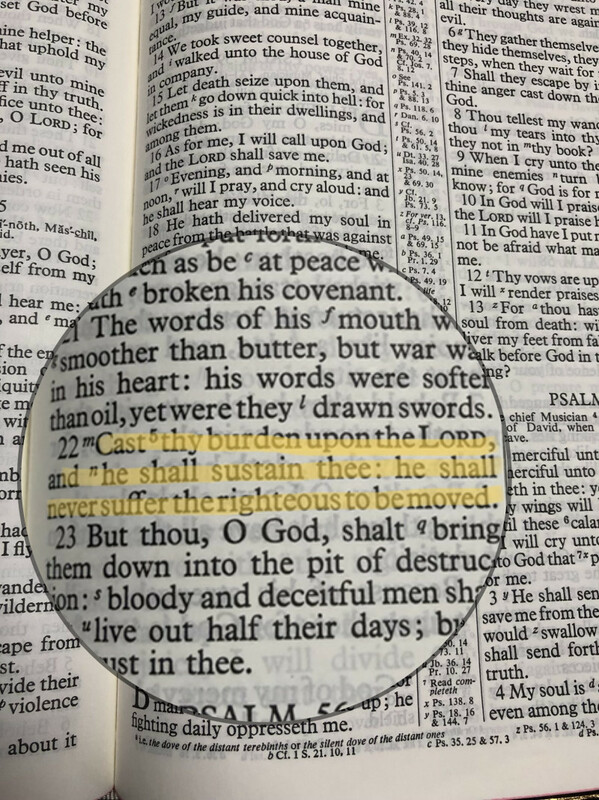 Learn to Burden Cast. - When you do have a concern, trouble, or fear, cast in on the Lord. He is big enough to carry your heavy load. Less worry means more room for happiness and peace. When you are tempted to worry, repent. Ask God for forgiveness from the sin of worrying and lacking faith and trust. He loves you and has promised to forgive you. Giving you one less thing to worry about. Rejoice in the fact that you have given God the responsibility of care of you and all that you have. Rejoice in the realization of how big God is and how much He loves you. Because there is nothing to big for God and no love greater than His for you, you will realize too that his plans for you are for your betterment. Finally, remember to hold on to things in this world lightly and hold on to God and his treasures tightly. Don’t worry or it just might be the death of you. Trust God instead. It is comforting to know that God knows our hearts. Because He knows your heart, He also knows your need. Gideon was a man cowering in fear from the enemy when God called him to deliver Israel from it’s oppression. Ultimately God God chose Gideon to deliver the Nation of Israel from oppression of a countless enemy with only an army of 300. 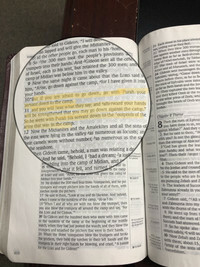 To do so God called Gideon to form an army of 32,000 soldiers, but then, very likely to Gideon’s dismay, God narrowed that army down to only 300. 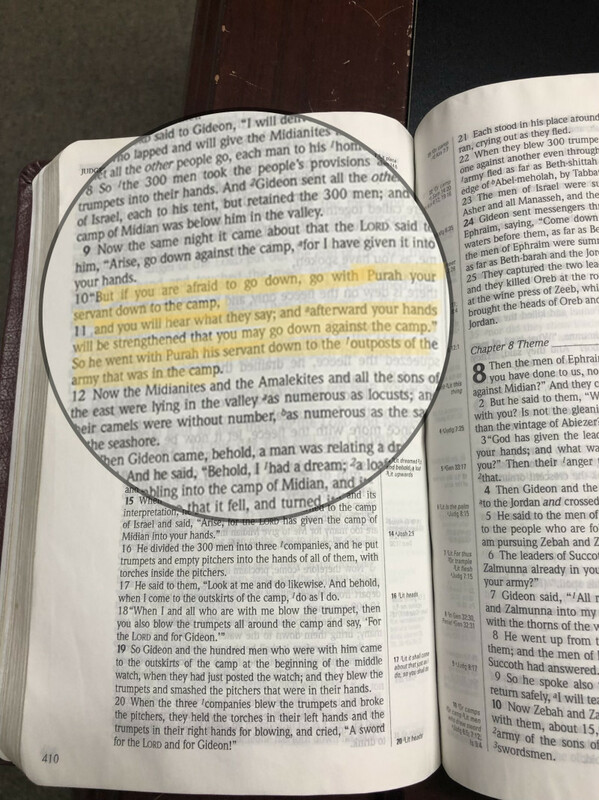 In calling Gideon to accomplish God’s will, God had made promise after promise of guaranteed victory and promise after promise that God Himself would go with Gideon. God had given sign after sign and miracle after mighty miracle to prove to Gideon that God would give the victory. Gideon then began to obey what God had called him to do. On the surface Gideon might have seemed to some to now be a man of courage. 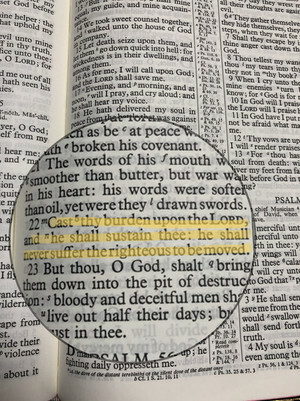 After all he had destroyed the altar of false God’s in his own town that belonged to his own father, even though he knew it might mean that men would seek to kill him. On the surface Gideon seemed a picture of courage...but God knew his heart. God knew that Gideon was still afraid and still doubting. So what was God’s response? God’s gracious response was to give another miraculous sign. God gave more irrefutable proof. That is what this verse is about. It is also proof that the God who knew Gideon’s heart, knows your heart. Aren’t you glad that the God of the Bible is the God who is still active today isn’t he lives of people? Aren’t you glad that God knows your heart? Aren’t you glad that when God knows something that no one else knows, He loving does something about it to calm your fears and deal with your heart? What is it today that you are dealing with in your heart? Maybe something that know one else knows or would even think about you. God knows and He stands ready to miraculously, lovingly, graciously, deal with it, if you will let Him. Won’t you let God have His way in your heart today? When Jesus is out of Focus, life is out of focus! I am a gun owner and staunch 2nd amendment advocate. Would the world be different if we, as Christians, had fought as vehemently against the Bible and prayer being removed from public schools, as we fight to defend our 2nd amendment rights? What if we were as compassionate in loving our fellow man, and sharing the truth of God’s love and gift of forgiveness and salvation as we are compassionate about the right to bear arms? What if spent as much time studying the Word of God as we do studying to prepare an argument for why the second amendment applies today for us to have AR-15’s, bump stocks and high capacity magazines? What if we stood as strongly against the decaying understanding of the sanctify of life via the legalization of abortion, the push for legalization of physician assisted suicide, and euthanasia, as we stand for our rights to own firearms. What if we said no to the violence portrayed in TV, movies, music, video games, etc as loudly as we say no to the anti-gun crowd crying for tighter, more restrictive gun laws? What if our children/grandchildren in America/world meant as much to us as our own constitutionally given rights and we invested as much in them as we do in our own rights? What if we were as quick to share in love the name of Jesus Christ and the gift of God given grace with others as we are quick to express our love of the NRA? Make no mistake, I believe strongly in the second amendment. I do not believe that more stringent gun control laws will have any impact to the good whatsoever in regards to mass shootings. I believe that I as an American have the right to bear arms for hunting, sport, and to defend myself, my family, and my home. I believe the hate that has led to so much violence to be a heart problem, not a gun problem. It is a sin problem and the only answer is Jesus Christ and the life changing power that comes in turning your life over to Him. But I also think we have gotten our priorities mixed up. The Bible says Love the Lord your God with all your heart, soul and mind, love your neighbor as yourself. I enjoy owning and shooting my guns. Maybe if we have our priorities right in putting God first, loving others as ourselves and teaching others to love God and love others as themselves, we would not have as much of a need for guns to defend ourselves, our loved ones, and our homes. Maybe if we had been loving God and loving others as we should, we wouldn’t have had to be having this gun rights debate to begin with. Would the world be different? I can’t help but believe it would. It maybe late as lives have been lost and friendships have been hurt. But as God is still God, and their is still breath in our lungs, and a beating heart in our chest, it is not too late until...until it is too late. The question is what will you change before it is too late.